Here are the top 10 players by category (AL & NL pitching & batting) in Box-Toppers points (BTP) for the 2017 season as of Aug. 24. Dodgers pitcher Clayton Kershaw clings to his lead in Box-Toppers weekly season player rankings, even though he’s been on the disabled list for more than a month. Two players—Nationals pitcher Max Scherzer (22.0 Box-Toppers points) and Red Sox pitcher Chris Sale (21.1)—have had opportunities to pass Kershaw’s 22.1 Box-Toppers points in recent weeks, but neither has done it. And so, Kershaw now leads the rankings for the 15th straight week. Scherzer moved within 1.1 Box-Toppers points of Kershaw after earning Player of the Game honors Aug. 7. Scherzer has had one chance to pass Kershaw on Aug. 13 and while he did earn Player of the Game honors (worth 1.0 Box-Toppers point) and move with 0.1 of Kershaw, he missed his chance to pass Kershaw, which would have happened if he’d earned NL Player of the Day (worth 1.7 Box-Toppers points) or overall Player of the Day (worth 2.0). Scherzer has since gone on the disabled list with a strained neck and could return as soon as Sunday. 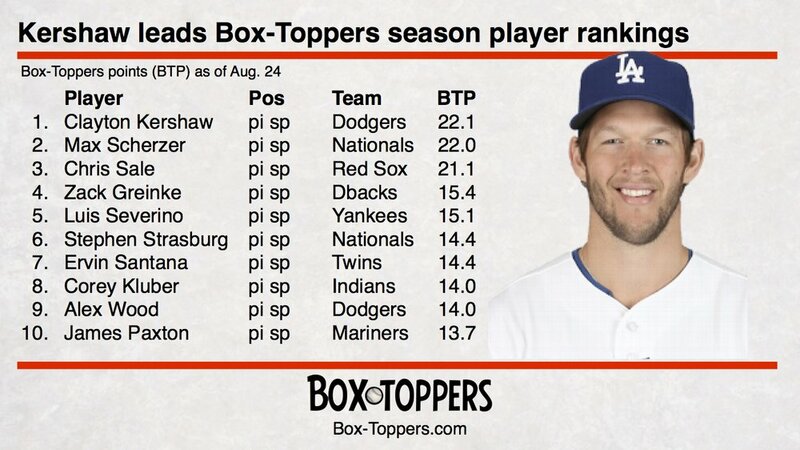 Sale moved within 1.0 Box-Toppers point of Kershaw after earning Player of the Day honors Aug. 13. Since then, Sale has had two chances to pass Kershaw on Aug. 19 and Aug. 24, but the Red Sox lost both games and Sale earned no Box-Toppers points. Scherzer also ranks second to Kershaw among National League pitchers. Sale holds a dominating lead over American League pitchers in Box-Toppers points. Kershaw, who went on the disabled list July 24, could be out until late August or early September. Last season, he had a herniated disk and missed 10 weeks, losing the commanding Box-Toppers points lead he had in 2016 and finishing second in final player rankings to Scherzer (25.7 points to 24.4). It was a year ago today (Aug. 25, 2016) that Scherzer passed Kershaw to take the 2016 Box-Toppers points lead. American League pitchers—Chris Sale of the Red Sox maintains his lead with 21.1 Box-Toppers points, earning no points in the past week. He leads second-place AL pitcher Luis Severino of the Yankees (15.1). Sale ranks third among all players, behind Kershaw (22.1) and Scherzer (22.0). National League batters—Anthony Rizzo of the Cubs maintains his lead with 11.5 Box-Toppers points, earning 1.0 point in the past week. He leads second-place NL batter Cody Bellinger of the Dodgers (8.7). Rizzo ranks 14th among all players. American League batters—Edwin Encarnacion of the Indians maintains his lead with 11.1 Box-Toppers points, earning no points in the past week. He leads second-place AL batter Ryon Healy of the Athletics (9.7). Encarnacion ranks 15th among all players. Nationals pitcher Stephen Strasburg rose onto Box-Toppers overall top 10 players list since last week. Strasburg (14.4 points) rises to sixth. He displaces Indians pitcher Carlos Carrasco (13.4), who falls to 11th. 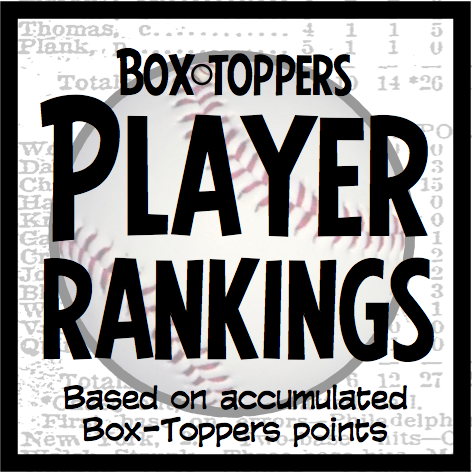 So far this season, 695 different players have earned Box-Toppers Player of the Game honors. There are 351 players who have more than 2.0 Box-Toppers points. There are 139 players who have made their Box-Toppers debut so far this season, the first time in their career they earned Player of the Game honors. Ten players debuted in the past week.